Dec. 24, 2014 6:00 p.m. It was year of new beginnings in Langley sports, as a professional lacrosses franchise and a junior B hockey team debuted in the community in 2014. It was also a year of championships, both won and lost, on fields and courts in the community. The Vancouver Stealthâ€™s first season in Langley was a frustrating one, as the pro lacrosse team limped to a 4-14 record. Amid much promise and hoopla, the Stealth relocated to Langley from Everett, Wash., in the summer of 2013, marking pro lacrosseâ€™s much anticipated return to B. C. after a decade-long absence. But injuries to key players and sub-par performances pretty much across the board turned what looked to be a promising season into a train wreck. After a 2-1 start, the Stealth went on to lose 13 of their final 15 games of the campaign. The Stealth went winless in April and ended their season on a five-game losing streak. And after drawing a near full house of 5,031 to their home opener, fan support was tepid. The Stealth averaged 3,590 fans per home game in an LEC arena bowl that has the capacity of seating roughly 5,500. That was the lowest average attendance in the nine-team NLL. On Dec. 21, the Stealth mourned the loss of former head coach Chris Hall, who died from cancer after a four-year battle with the disease. In June, the Stealth announced that Hall retired from coaching due to health related matters. Two months later, Hall was voted into the NLL Hall of Fame. On March 8 at the Langley Events Centre, the Brookswood Bobcats won the B.C. senior girls high school Triple A basketball title. The â€˜Cats clawed to a 64-57 win over the Oak Bay Breakers from Victoria in the gold medal game at the B.C. tournament, which ran March 5-8 at the Langley Events Centre. The win ended an eight-year drought for the Bobcats from Brookswood Secondary, who last stood at the top of the provincial mountain in 2006, under the guidance of then head coach Scott Reeves. That was the final year of a Brookswood dynasty in the mid-2000s. The Bobcats won three consecutive B.C. titles from 2004 to â€˜06. And the 2014 win was redemption for the Bobcats. In last yearâ€™s B.C. championship game at the LEC, they lost 59-49 to the South Kamloops Titans. Bobcats guard Marissa van Noort was thrilled after the victory. In late November, Langley Fundamental Middle Secondary Schoolâ€™s junior boys volleyball team capped an fantastic season with a B.C. title victory. In an all-Langley final, the Titans defeated the Langley Christian Lightning in four sets to win the provincial tournament that was held in West Kelowna Nov. 20-22. Middle Phil Stahl made his biggest impact in the provincial semifinal and final games, and was named tournament MVP. â€œHe was very dominant in the semis and in the final,â€ Titans head coach Dan Johnson said. The Langley Christian Lightning lived up to their No. 1 ranking at the B.C. high school junior girls volleyball championships in late November. The Lightning continued their season-long run of success by winning the provincial title at Deltaâ€™s Seaquam Secondary. Langley Christianâ€™s final game of the season was arguably its toughest, as it battled to a three-set win over Abbotsfordâ€™s MEI Eagles in the gold-medal matchup. Lightning Grade 10 setter Olivia Heinen was named tournament MVP, while middle Jayden Bontkes and power Morgan Hindy earned first team all-star selections. Lightning head coach Lisa Bontkes said the Lightning players have had each otherâ€™s backs all season. 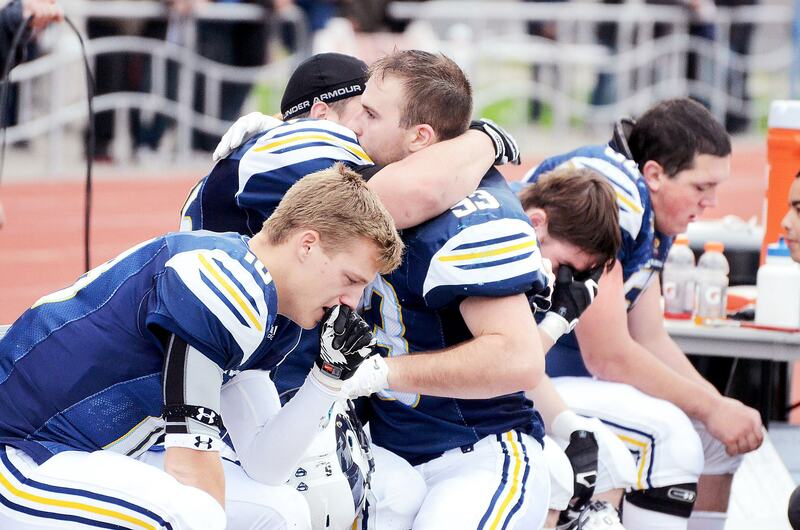 For the second time in three years, the Saskatoon Hilltops hoisted the Canadian Bowl at McLeod Stadium. The difference is, this time around, in a game played in front of a full house on Nov. 8, this win over the Langley Rams was a blowout. Saskatoon turned a tight game into a rout, outscoring the Rams 31-7 after the first quarter to win 39-14 in the Canadian junior football championship game. The game had a different completion from the Canadian Bowl in 2012, when the Hilltops overcame a 15-point halftime deficit to eke out a 23-21 victory. The Rams took some solace in the fact they had a very solid regular season, finishing second in the B.C. Football Conference with a 7-3 record, just behind the frontrunning, 9-1 Okanagan Sun. In one of two BCFC semifinals, the Rams edged the Kamloops Broncos 48-46, before downing the Sun 23-19 in the final to win the Cullen Cup (BCFC) title for the seventh time in franchise history. Joel Harrison was modest after winning the B.C. high school junior boys cross country race in Colwood. The Walnut Grove Secondary School (WGSS) Grade 10 student took top spot in the junior boys event in impressive fashion, finishing the course in 17:45, well ahead of second-place runner Jack Stanley from Oak Bay, who crossed the finish line in 17:58. In doing so, Harrison improved on his performance at the 2013 B.C. junior boys event, in which he finished second at Aldergrove Lake Park. â€œI think this year, my team was much more in the running to win the championship, so I pushed myself as much as I could to help the team win it,â€ Harrison said. In April, the Aldergrove Kodiaks junior B hockey team lost 5-2 to the Beaver Valley Nitehawks in the gold medal game of the Cyclone Taylor Cup. The loss to the Fruitvale squad put an end to the season for the Kodiaks, who captured the Pacific Junior Hockey League playoff title before battling to the final of the B.C. junior B championship tournament. Despite the loss, Kodiaks associate coach and general manager Rick Harkins was extremely proud of his players, who put together the most successful season in the franchiseâ€™s six-year history. In their final game of the season, the Kodiaks were outscored 4-1 in the third period by Nitehawks, who, in winning the provincial title, have punched their ticket to the Keystone Cup Western Canadian championship tourney being held later that month in Abbotsford. Canadaâ€™s U18 inline hockey team, including Langleyâ€™s Baylee Wright, took home a silver medal from the world championship tournament in France. The host team captured the junior (U18) title at the FIRS World Championships, after beating a Canadian team 6-4 in the gold medal final on July 6. The tourneyâ€™s championship game brought together a pair of undefeated teams and was played in front of roughly 6,000 fans inside the Palais des Sports arena in Toulouse, France. France led 2-1 after the first half and had a 4-3 edge in goals in the second half. Wright, who at 16 was Canadaâ€™s youngest player, assisted on Troy Ringâ€™s shorthanded goal during the second half. France definitely had home floor advantage. â€œIt was packed and they were all [cheering] for France, and not one fan for us,â€ said Wright, originally profiled in the June 12 Langley Advance [Forward joining U18 nats at world tourney in France]. Former Vancouver Canuck and Toronto Maple Leaf John Craighead was the man behind bringing junior hockey back to the George Preston Recreation Centre after a five-year absence. The Pacific Junior Hockey Leagueâ€™s Langley Knights relocated to Brookswood from North Delta in the off-season. This is the first ever junior B team to call the 41-year-old GPRC home. â€œThere is absolutely no question the buzz is going to be great when people hear and see what weâ€™ve done here,â€ Craighead said. A few incarnations of B.C. Hockey League Langley squads have gone to battle on the GPRC ice surface, including the junior A Lords, Eagles, Thunder (before changing their name to the Hornets) and finally, Chiefs, who, after moving to the Langley Events Centre, relocated to Chilliwack in 2011. At their Christmas break, the Knights sat second in the PJHLâ€™s Harold Brittain Conference with a 15-14-1-1 mark. Despite losing their last four games before the break, the Knights were just two points back of the second place Abbotsford Pilots and three behind the first-place Aldergrove Kodiaks, who after winning the league title last season, have built a solid 14-9-2-5 record going into Christmas break. Dorothy Ludwig added another international medal to her already impressive collection during the summer. The 35-year-old Langley resident captured individual bronze in the womenâ€™s 10m air pistol competition at the Commonwealth Games in Glasgow, Scotland. Ludwigâ€™s kid sister, 33-year-old Lynda Kiejko, finished in fifth place. The shooting events were held at a satellite village in Dundee.